Growing up as a child in Indonesia one of my favorite fruits to eat was jambu. Biting into the small, crisp and mildly sweet, watery fruit was thirst quenching and delicious. Jambu grows naturally from southern India to eastern Malaya. A member of the myrtle family, this fruit is the smallest in a group of similar fruits of the Syzygium genus. of 10 to 20 feet in height. Branches grow close to the ground from a short, crooked trunk. The crown is open and non-symmetrical. It likes plenty of rain evenly spaced throughout the year. The leathery leaves grow opposite each other on short, thick stems that clasp the twig. They are oblong in shape, narrower at the stem end. They are 2 to 10 inches long, 1 to 6 inches wide. They are pink when young and become dull, light-green above and yellowish-green beneath when mature. The flowers have a faint fragrance and grow in loose clusters of 3 to 7 at the end of branches. The petals are pale yellow, yellow-white or pink and the stamens are uni-colored. In Indonesia the tree blooms twice a year, in July and again in September. The fruits ripen in August and November. The jambu fruit has a shiny, thin skin which varies from white to light red. About 1 inch long and 1-1.5 inches wide, they are shaped somewhat like a pear with a narrow neck and a wide apex. The fruit curves in and forms a concave indentation from which stiff sepals and the style protrude. The flesh is white or pink, slightly fragrant, crisp and juicy with a faint sweet flavor. The fruit has about 1-3 seeds which, together with the roots, are considered poisonous. 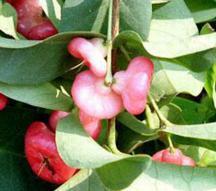 Red and white jambu are found in Indonesia. The red jambus are the smallest fruit, sweet and juicy, with the white ones being very acidic. In Malasia there is a wide variety of color, ranging from palest green, delicate blush pink to deep crimson and a sort of brownish red. Green jambu are very crunchy but not as juicy. Southeast Asian rainforest animals, like monkeys, gibbons and jambu fruit doves rely on jambu as part of their diet. Growing wild, the jambu is also cultivated throughout Southeast Asia and is not endangered. Morton, Julia F. Fruits of Warm Climates. Creative Resources Systems, Inc. 1987. pp. 383-836.